I have one of the best and easiest homemade sugar scrub recipes for you! The recipe takes only minutes to make and it’s so diverse. You can turn this into a Brown Sugar Scrub Recipe or a Honey Sugar Scrub Recipe! Follow this sugar scrub formula and customize it to your own likes and smells. These homemade recipes make excellent gift ideas too. You can create your own Sugar scrub to give as gifts this year. It’s a perfect idea and very inexpensive to make. You are giving the gift of relaxation and everyone could use a little of that! 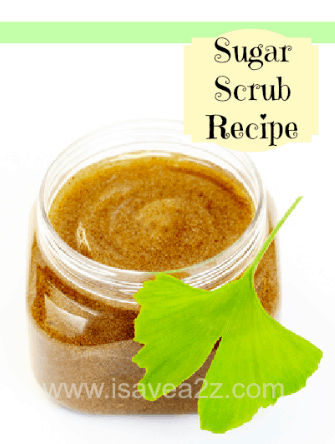 You could even print this recipe and add a label calling it the Best Exfoliating Sugar Scrub Recipe to your gift! By customizing the scents of the essential oils you use, you can personalize each scrub with each persons favorite scents in mind! I tend to purchase most of my essentail oils on Amazon unless my local natural store is having a sale. After using the scrub, your skin will feel smooth, refreshed, and will have a healthy, exfoliated glow. Make your very own Sugar Scrub with this very simple recipe. Add a label with the type of mixture it is and the scent. —->>>>Be sure to check out my other recipe for a Do It Yourself Sugar Scrub Copy Cat of Mary Kay’s Satin Hands. You will not believe what it’s made with! Oh so simple! By Jennifer on November 28, 2015 Crafts, Frugal Living, Gift Guide.